This EA uses most popular Indicators to test your own strategy and use it to trade. You can combine each Indicator to match your strategy. 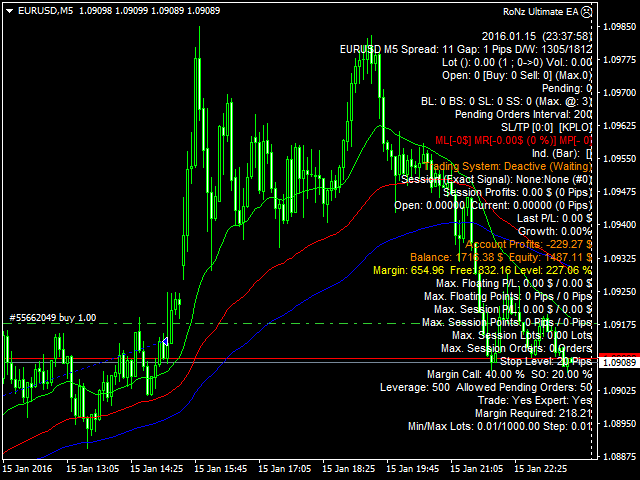 Many features included like Auto Stop Loss, Take Profit, Trailing Stop, Profit Lock, Pending Orders, Etc. Each Indicator has additional parameters eg. TimeFrame, Signal Method, Reverse Signal. Strategy Check Method: (Tick by Tick/Bar by Bar) - Checking entry/exit strategy Tick by Tick/Bar by Bar. Must Match All Indicator: Determine whether signal must match all combined indicators or one of combined indicators. Reverse All Signals: Reverse all signal. All Indicator Parameters: All default indicator input parameters. Signal Method: Determine how the indicator triggering entry/exit signal. Reverse Signal: Reverse all signals. Start/Stop Hour/Minute: Trading start/stop hour/minute. Close Losses/Profit Orders on Stop Time: Close all order when account is in loss/profit. Max. Loss to Close (Points): Max. Loss to reach before closing losses orders after stop time. Min. Profit to Close (Points): Min. Profit. to reach before closing profit orders after stop time. Start/Stop Day: Trading start/stop day. Close All Orders on Stop Day: Close all orders when reach stop day. Minimum Balance: Min. required balance. Initial Pending Orders: Amount of initial pending orders. Limit/Stop Order Distance (Points): Distance between pending orders. Expiration (Hours): Set expiration time. Min. Martingale Order Distance (Points): Min. distance to open martingale order. Only When Hedging Detected: (True/False) Allow Averaging Only When Hedging Detected. Max. Orders to Look For Breakeven Close: Max. Order to reach before EA look for breakeven close. Min. Profit For Breakeven Close ($): Min. Profit to reach for breakeven close. Min. Averaging Order Distance (Points): Min. distance to open averaging order. Fixed Max. Risk (Points): Value for Fixed Risk Point type. Lot Factor: Lot factor for used with increased lots type. Session StopLoss (Pips): Fixed stop loss for all opened orders. Max. Profit/Loss ($ / %): Max. profit/losses/percent losses in money. All orders will closed when reach one of these values. Exit By SL or TP Only: Exit only when hitting SL/TP. Place Pending Order When Profit Order Closed: Enable EA to place pending order when last order closed with profit. Keep Order Locked With Profit: Keep order locked with profit opened. Previous Bar Counts: Amount of previous bar to counts. SL to High/Low Points: Distance between stoploss and detected High/Low. Max. StopLoss Method: (Deny Order/Limit Stoploss) – Action take when auto-sl reach Max. stop loss. Ratio from Stop Loss: Set TP ratio based on stop loss. Lock Profit After (Points): Points to reach when locking profit. Profit Lock (Points): Amount of points to lock when reach above value. Trailing Method: (Step Keep Distance/Classic/Step by Step/Based on SL-Ratio) - Determine trailing stop method. Ratio from SL (SL-Based Ratio Only): Trailing stop ratio based on SL points. Max. Spread: Max. spread allowed to open trade. Max. Gap: Max. gap allowed to open trade. Create Session Report File (.CSV): Create trades session report file in .CSV format. Useful for drawdown analyzing purpose. + Removed Lot Risk Type parameter. Free margin is used as a default lot risk. - Create Session Report File (.CSV) : Create trades session report file in .CSV format. Useful for drawdown analyzing purpose.